Propane remains an extremely popular fuel source among businesses. It is convenient to locate and purchase. It burns clean, making the air safer to breathe. It can safely be stored for long periods of time, and it’s affordable. It’s also extremely versatile, widely used across many different types of products. Propane can just as easily be used to fire up the BBQ or to heat patios as it can be used to fuel vehicles. For all of these reasons and more, the use of propane at Mississauga businesses is exploding. Here are three of the most popular uses for propane at our Mississauga business clients. Forklift Fuel. Propane is a very popular fuel for forklifts due to many of the benefits we mentioned above. It burns clean so it can be safely used indoors and outdoors. The fuel cylinders are portable and easily stored so you can place large orders well in advance of your need for the fuel and are guaranteed to have it on hand when you need it. It’s also a more cost-effective fuel than gas and changing out tanks is quick, easy, and safe. Space Heaters. Heating is one area that is often overlooked as a potential use for propane. Winter in Mississauga is cold! Propane-powered space heaters can warm up cold garages and warehouses and since small tanks are portable, they can be moved with the heater to areas that need heat the most. One of the big advantages of propane for heating is that it can be safely stored outside even in sub-zero temperatures. Backup Generators. Again, the safety and reliability of propane is a major reason why it is used to power standby or backup generators. Power loss can be costly for businesses, but purchasing a backup generator guards against this. Propane powered generators help businesses stay open or keep critical functions up and running when the power goes out. If your business already uses propane for forklifts or other functions, you don’t even need to buy special fuel – you already have it on hand. Businesses that rely on propane also need a reliable propane supplier. Count on Josef Gas for on-time delivery, year-round. We have the largest single propane storage tank in the GTA! 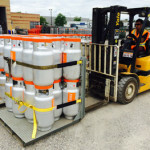 Call us at 416.658.1212 or email info@josefgases.com to get set up on a regular delivery schedule so you never have to worry about having enough propane on hand for your needs!